The Red Bull was a London public amphi-theatre located in Upper Street, Clerkenwell. It was built in about 1604 by Aaron Holland. It's reputation was the worst of all of the amphitheatres with frequent brawls and rowdyness. Several theatregoers were called before Middlesex justices in 1610, charged with committing a "notable outrage" at Theatre. The first acting troupe to play at the Red Bull were the Queen Anne's Men, formally Worcester's men, who had been at the Rose since early 1600. 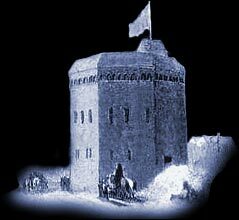 The Queens Men occupied it until 1617, when they took up residence at the Cockpit Theatre in Drury Lane. In 1625 the Red Bull was renovated and modified. The Red Bull theater closed for play acting during the Cromwell era but it reopened at the Restoration when Thomas Killigrew's company played there. By 1663 the Red Bull theater was in disuse and was demolished in 1665. The first ‘upgrading’ of an Inn-yard to a playhouse is said to have taken place at The Red Lion, in Stepney in 1567.